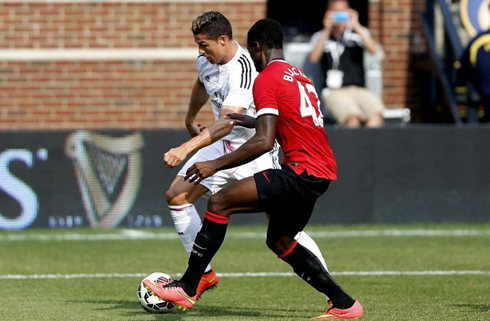 Real Madrid will come out of the United States without having won a single game during their pre-season tour and this time, they ended up falling at the hands of Louis Van Gaal's Manchester United. 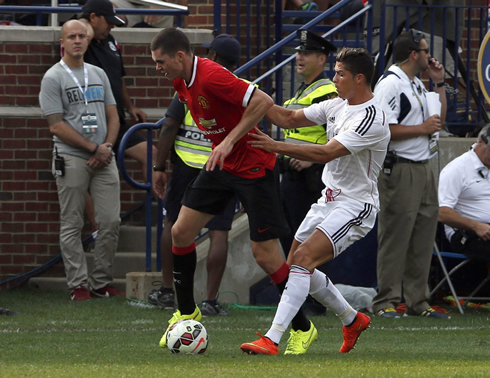 The European champions didn't get off to a good start in Michigan, as they saw the Red Devils imposing a more pragmatic football on the pitch and which would ultimately lead to a Merengues' 3-1 loss. Gareth Bale got to score Real Madrid's only goal still in the first half, but Manchester United marked their superiority thanks to a brace from Ashley Young and a late goal from Javier Hernández (Chicharito). The good news for Real Madrid fans are that Cristiano Ronaldo finally made his return to the fields, as Carlo Ancelotti decided to grant the Portuguese star with a bit less than 15 minutes to kickoff his pre-season. 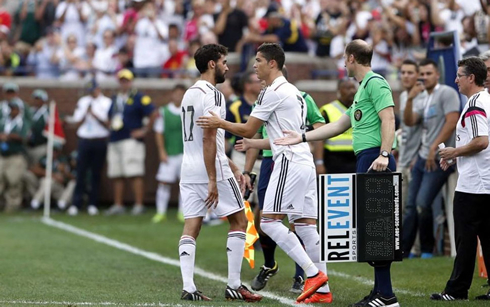 With several first team players still unavailable to give their contribution to the team in this US pre-season tour, Carlo Ancelotti had to bring on a few changes and innovations into Real Madrid's starting eleven. 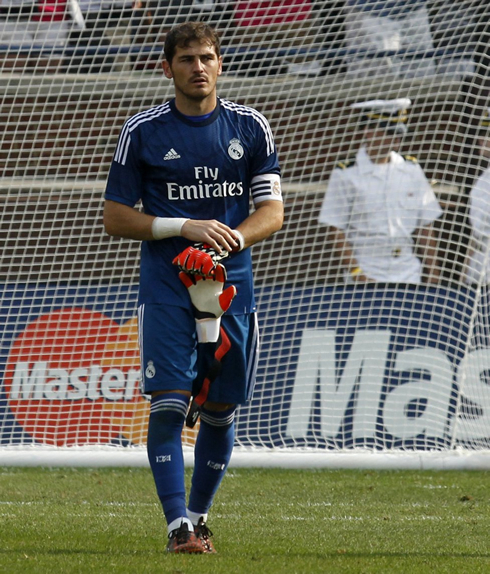 Iker Casillas repeated his start as the main goalkeeper, with Arbeloa and Nacho taking the full-backs positions in defense. In the center and as usual, Pepe and Sergio Ramos teamed up to strengthen the defensive block. Midfield was basically the same as we had already seen against AS Roma, with Illarramendi, Xabi Alonso and Modric being in charge of linking up the team's sectors. The attacking duties were left to Gareth Bale, Isco and surprisingly Carvajal, a player whom we are a lot more used to see playing as a right-back. This Saturday's game was far from being a friendly like many others. 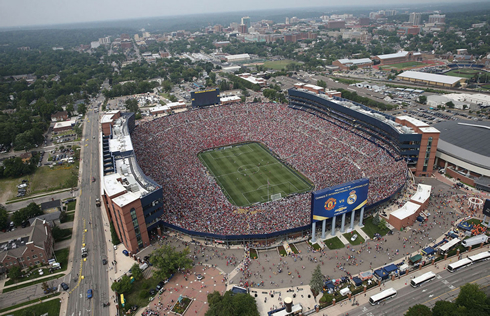 The 109.318 spectators (more or less) watching the game at the Michigan Stadium in Ann Arbor, have actually established a new all-time record for a "soccer" attendance in the United States. 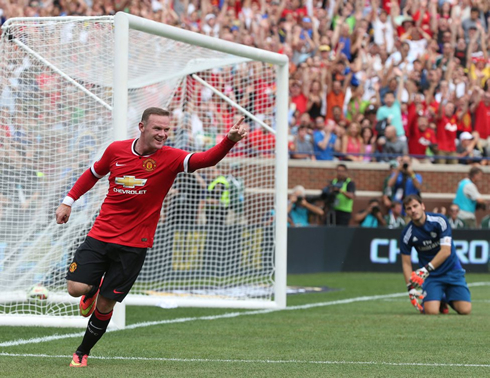 It's great to see that the sport continues its growth path in the US. In such a charismatic evening like this, it would be Manchester United breaking the deadlock early in the game and they've managed to do it in great fashion. As were stepping into the 21st minute of the first half, the Red Devils showed off a great passing game upfront, allowing for Ashley Young to finish it off at the far post and beating Iker Casillas for the first time on the night through an accurate right-foot shot. Louis Van Gaal had plenty of reasons to be happy with what he had just seen on the pitch, since the understanding between Fletcher, Rooney, Welbeck and Ashley Young was just top-notch. However, it didn't take long for us to see a slight reaction from Carlo Ancelotti's men. 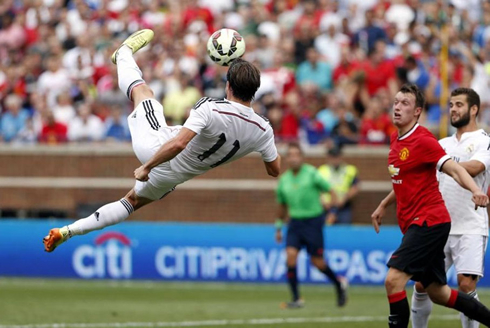 Unsurprisingly, the response came from an attacking initiative brought on by Gareth Bale, clearly one of Real Madrid's most in-form players in this US pre-season tour. The Welshman showed off his great speed when he drew a foul inside Man Utd's box on the unexperienced Michael Keane, leaving no option to the referee but to immediately point to the spot instants after the former Tottenham player went to the ground. Bale himself stepped up to the mark and slotted the penalty into the back of the net, setting things back to square one in a fully packed Michigan stadium in Ann Arbor. The 1-1 draw didn't hold for too long either, though. Manchester United got back in the driving seat in the 36th minute of the first half and even though the official goalscorer was again Ashley Young, in all fairness the credits for this goal deserve to be split almost on a 50-50 basis with Wayne Rooney. The former Aston Villa winger delivered a great curled cross from the left into Real Madrid's box and benefited from Rooney barely grazing the ball with his head to trick Iker Casillas. 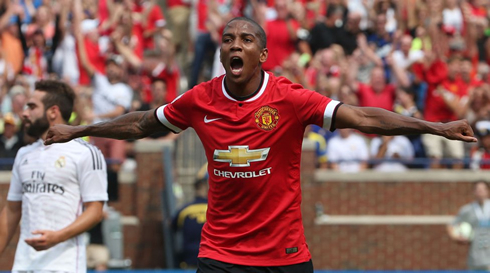 The ball went in and with that, Man Utd had just restored their lead in the game. The final 3-1 arrived shortly after Cristiano Ronaldo had already come in. We were about to enter the final 10 minutes of the game when a terrific cross from Shinji Kagawa resulted on a perfect assist to Javier Hernández. The Mexican dived to meet the cross and scored from an easy header inside Real Madrid's box, already from a very close range. Iker Casillas left the impression that he hesitated a little bit in chasing the ball in the air and a prolific striker like Chicharito didn't waste such a golden opportunity to also leave his mark in a game like this. Real Madrid will now travel back to Spain in order to continue their pre-season works and Carlo Ancelotti will surely be happy to know that he'll have players Karim Benzema, Varane and James Rodríguez already waiting for him there. Toni Kroos and Sami Khedira are also expected to join the team in Valdebebas (Real Madrid's training center) in the next days, which means that the Merengues can finally prepare their next fixture against Sevilla (on August 12, in Cardiff) in full force, in a final that will decide who takes home the first trophy of the season, the UEFA Super Cup. Attackers: Carvajal, Gareth Bale, Isco. 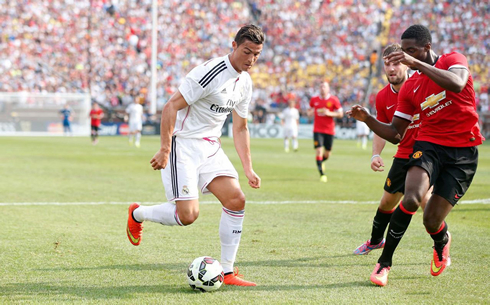 Cristiano Ronaldo next games for Real Madrid will be against Sevilla, for the UEFA Super Cup final, on August 12. You can watch Juventus live stream, Real Madrid vs Sevilla, Barcelona vs Napoli, Manchester United vs Liverpool, and Arsenal vs AS Monaco, all matches provided from our live streaming pages.